My good news is that yesterday was my first day of teaching for the semester. I always love the first day of school even though it leaves me with a dry throat and sore feet. I got to meet two classes of TE 401 yesterday. TE 401 is the elementary social studies methods course. I had a great time teaching it last fall, and I seem to have a good group again. Last year I only taught in the morning, so I did have a bit of a rude awakening when I finished the morning class and realized I needed to summon the same energy again for the afternoon class. Hopefully I didn’t short change the 12:40 group, even after a mix-up with room assignments left me a bit rattled. I approach the first day of class as a community-building day. The students in the elemenary prep program take their methods classes together all year, so they see each other at minimum 6 hours a week until May. Some of them even see each other at their field placements. So, I think it is super important to establish a family atmosphere and get along well together. I try this by setting up a class Social Contract on the first day. We talk about how we want to be treated in the course and what they expect from each other and from me, and then we all sign it to agree. I bring it to class every day so they are reminded of what we determined as valuable for the group and so they don’t forget that we’re all in this together. I also start every single class with “Good News”. I learned this and the Social Contract from NHA actually, through a classroom management program called Capturing Kids Hearts that focuses on building relationships. I ask the students to share anything good in their lives for the first 2-5 minutes of class. It never fails to make people smile and it puts everybody on a positive note. This year, I’d like to try another aspect of CKH–Affirmations. At the end of class, people can share something positive they’d like to commend the group about what we have done over the 3 hours. I know this all sounds very mushy to do with adults, but I guess that’s the kind of teacher I am. 🙂 I truly think a little positivity goes a long way to ensuring our semester goes well. And at the very least, I’m hoping they see it as a model for how they can develop relationships with their future students. I was physically drained yesterday, but mentally refreshed. I think it’s going to be a fun semester. Today is also the first college football game of the season. 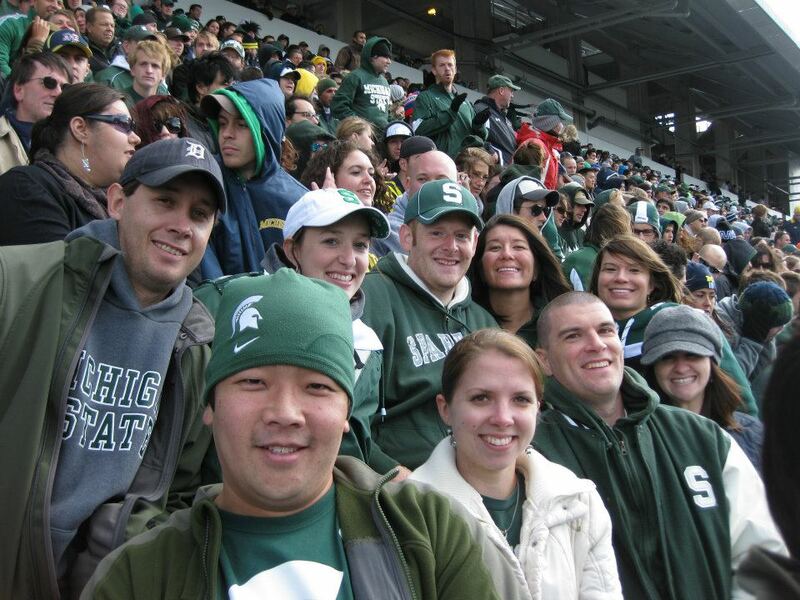 For the last 3 years, Mike & I have purchased MSU football season tickets with some other people from my cohort. This will be the 4th year of attending nearly every home game. Although it definitely monopolizes an entire Saturday, it’s worth it to get a brain break. These guys are not only my academic support during my doctoral program, but what I would like to call my “sanity support”. I can count on them to have fun at a football game, or grab dinner with me at Crunchy’s when I come into town, or give me a place to crash when I need it. And that’s been very important to me through this crazy PhD journey. I am working here because Mike is working here. He’s currently at a plant in Papa, Hungary and I am in a nearby town waiting for him to be done for the day so we can head to Budapest. I don’t even know the name of the town exactly. Vezprem? Either way, this is quite the adventure. Mike has been here for over 2 weeks now, working in Germany. He’s starting his last week here working in Hungary, so I joined him to travel here over the weekend. I fly home tomorrow, and he flies home Thursday. It’s a quick trip, and not exactly timed perfectly, what with the semester starting last week officially, but sometimes a get-away is needed. 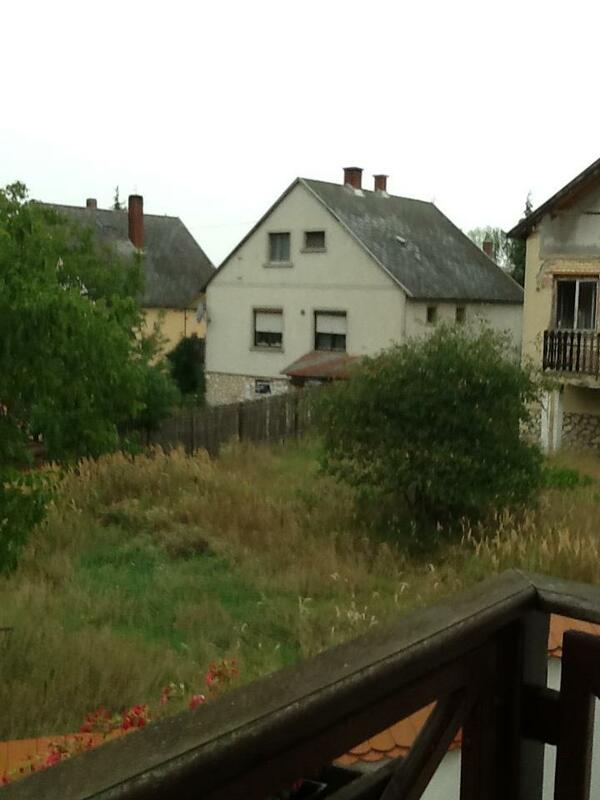 And every vacation I have taken in the last 4 years hasn’t exactly been work-free, hence the reason why I am lesson planning in a remote Hungarian village. Yep, this vacation is really the end of my summer. On Thursday I meet 50 new TE401 students, and next Tuesday I meet the 5th graders I’ll be working with for my dissertation study as well as meeting with my committee to talk about what I finished this summer. I’m about to get a lot busier, so just about the only time I have left to myself is an 8-hr plane ride. Fall is getting closer. The official date for the beginning of my 2012-2013 school year is Aug 20 when I have meetings to prepare for my classes for the upcoming year. The Lions had their first preseason game. In just a little under 3 weeks I’ll be sitting at MSU’s first football game of the season. This means summer is nearly over and it’s time for me to reflect on what I have accomplished after 10 weeks of working NHA-free. I spent a good portion of the last couple of weeks working on human subjects research approval. Since I am conducting research on minors (fifth-graders) and in a “power position” as their teacher, I have to submit my study to a third party review board at MSU called “IRB.” They decide whether I’ve taken the necessary procedures to protect my research subjects and I have to wait to do anything on my study until I have their approval. As much of a chore this is (it’s mostly wordsmithing), it’s definitely necessary. By accident at the same time I was reading a book for fun called The Immortal Life of Henrietta Lacks, about a woman who was used as a research subject for cancer research without her (or her family’s) consent. Since her cells ended up being very important in several medical research breakthroughs, she was famous and in a sense exploited, to the detriment of her family after her death. This book made me think harder about the importance of ethical research, and I’m hoping to count it as time spent toward my RCR requirements this year. Every grad student at MSU must spent 2-5 hours a year doing work to improve our knowledge of Responsible Conduct of Research (RCR) and ethical research practices. 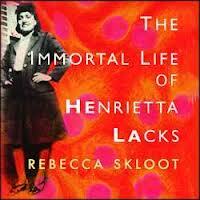 Maybe Henrietta’s story will count. I highly recommend anyone read it, not just researchers. I’m by no means doing medical research, but the children in my study have rights that need to be protected as well, so IRB approval is important. I think I am very close to official approval–I am waiting on the official documents which should be arriving today according to my case manager at IRB. My study was deemed “exempt”, which essentially means it’s not very intrusive into the lives of the children (the study is happening at school during their regular instruction–they don’t have to do anything too special other than what they would normally do at school). Not like collecting cells. 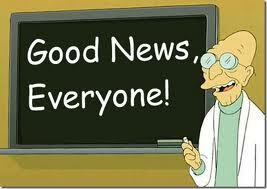 I also made a very-nearly-final revision of my dissertation proposal and then summarized my changes for my committee. I am hoping to meet with them in the next couple of weeks to explain all the work I have done this summer. It feels good to be very nearly done with the proposal. Come fall, I’ll be focusing on the “real thing” and I can put the proposal to bed officially.